The Retirement and Honoring of our Beloved Rabbi Amy R. Perlin, D.D. Rabbi Perlin was ordained by the Hebrew Union College-Jewish Institute of Religion (HUC-JIR) in 1982. When she and her growing family moved to Fairfax Station four years later, a handful of local families invited her to join them in founding a new Reform congregation. The demand for TBS was clear when 100 mostly unaffiliated families from several nearby communities came together for High Holy Day services in the fall of 1986. They included civil servants, teachers, military leaders, physicians, and many more — all determined to build a vibrant and meaningful Jewish life for their families in the far Northern Virginia suburbs. Within nine years, TBS consecrated its permanent home, and in time welcomed hundreds of families, many multi-generational, from an expanding geographical area. nationally, as a model for retaining and inspiring generations of youth to continue through Confirmation and Post-Cofirmation, and for sending a record number of rabbinic students to HUC-JIR. Although Rabbi Perlin retired effective July 1, 2018, after 36 years in the rabbinate, we are determined that her legacy will live on through the thriving community she built and served for 32 years. We are delighted and privileged that Rabbi Perlin will be our temple’s Founding Rabbi Emerita upon her retirement. Over the last several months, our congregation has joined together at various events to celebrate her extraordinary achievements and the many ways she has touched our lives. We held a wonderful musical weekend in April, and an amazing gala dinner to which leaders from the Reform movement and other dignitaries joined temple members in honoring Rabbi Perlin. A special tribute book was created and provided to each attendee of the gala. To help ensure the continuity of Reform Judaism here and elsewhere, and to commemorate the invaluable leadership provided by Rabbi Perlin and her family, we have established the Temple B’nai Shalom Rabbi Amy R. Perlin and Gary L. Perlin Endowment. 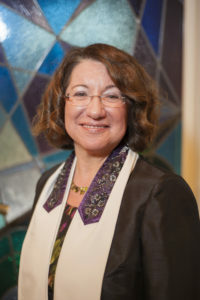 Rabbi Perlin is a pioneer and TBS is her legacy, and your contribution honors her extraordinary leadership by sustaining Reform Judaism and our thriving community in Northern Virginia. For details on the Temple B’nai Shalom Rabbi Amy R. Perlin and Gary L. Perlin Endowment, please click here. Please click here to find our FAQs about the transition process at TBS.